Running for over 10 Years! 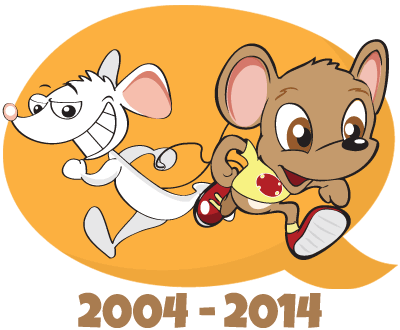 Last year (2014), Run Mouse Run celebrated its 10th Birthday by launching a new cartoon mascot. Mike the Mouse replaced the previous mouse that had existed since 2004, when this small business was first registered. Since 2004, Run Mouse Run has been involved in various large and small marketing based business projects around Perth (WA), illustrated two children’s books and has accumulated interstate and international clients and partnerships in places such as Los Angeles, London and Amsterdam. Within the last year, Run Mouse Run introduced cartoon workshops for children and added animation to its list of services. Run Mouse Run’s motto is “Create Happiness!”. It was in a conversation with coach and CEO of People Solutions, Steve Bowler, I realised that I had created a service based on the act I became known for in various workplaces. 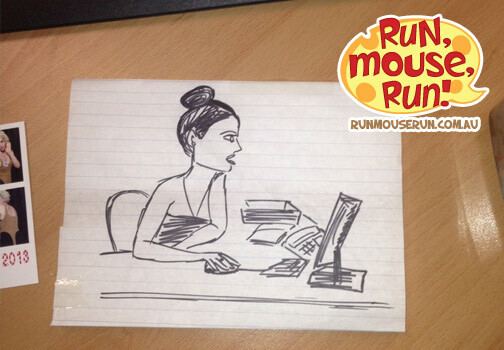 I would slip a funny drawing onto someone’s desk to get a reaction… usually a laugh! When I bump into old colleagues, I am always surprised that they still have kept the little scribbles I drew years before. It told me that no matter how the world changes, people will always value these simple drawings. Cartoons and drawings… the oldest form of storytelling in the world! Applying my motto to my services means that I create artwork and graphics to inspire others and create a happy experience for myself and my clients, whatever the task. Walt Disney’s famous quote: “It was all started by a mouse”, referring to the success of the Walt Disney empire, was said to remind him to never loose sight of small humble beginnings. For me, the quote means that a small business, or an idea that begins with one person, has the potential to be so much more than expected!